Join us for a premier adventure in the Sierra Nevada foothills that combines two of California’s favorite whitewater runs: the classic South Fork and the unique North Fork of the American River. Flowing through the heart of Gold Country, the South Fork includes rapids which are challenging, yet not extreme. There is plenty of time to indulge in family or group bonding, playful joke telling, and spirited water fighting. In-between the rapids, there’s always a little time for a refreshing swim in the cool, clear water. With the experience of the South Fork under your belt, you will be ready to tackle the adventures of the North Fork of the American! Intricate boulder gardens, rushing falls and staircase drops promise intense paddling and adrenaline-inspiring thrills. The North Fork is an untamed Sierra Nevada beauty that is well worth enjoying. 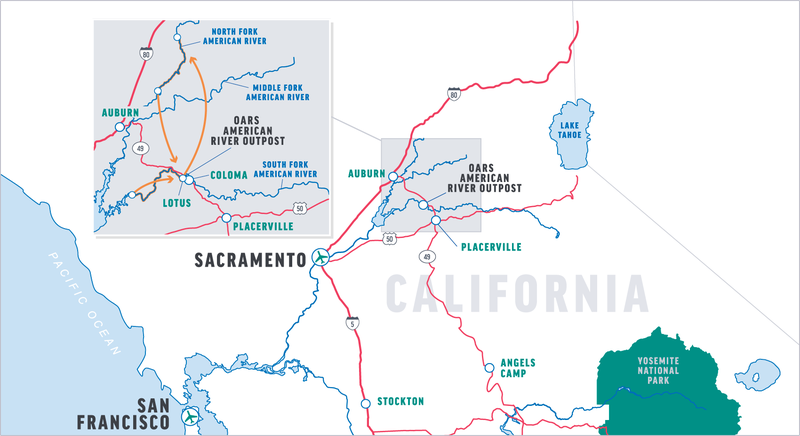 The trip includes a night of catered riverside camping at our OARS American River Outpost. The South Fork’s exciting Class III whitewater is near-perfect fun for the whole family! The water on the South Fork is released during summer months from hydroelectric facilities located upstream. Such water releases are not subject to the control of El Dorado County or commercial rafting companies. The North Fork is an undammed Wild and Scenic River, so the season depends on the preceding winter’s snowfall. To increase your safety, we expect everyone to watch our 23-minute Whitewater Orientation video before joining us. Watch at https://www.oars.com/experience/safety/ or call 800-346-6277 to request a free DVD. Please don’t leave home without watching. You will meet your trip leader neat our camp store at the OARS American River Outpost at 10:30 AM or 11:00 AM. Roads around here are winding, so please be sure to allow for plenty of travel time. Our river-side campground and base of operations is in the heart of the twin towns of Lotus and Coloma. Our peaceful hideaway is surrounded by plenty of history, recreational opportunities and cultural activities. After you check in with your trip leader, your guides will deliver an orientation and safety talk and fit you with your safety gear. Several miles of Class II rapids on the South Fork allow you to warm up and enjoy and plenty of swimming opportunities before entering the ever-exciting “Gorge” later in the day. Come lunchtime, we will pull over to a beach for a delicious picnic. Your guides will lay out an abundant spread of cold cuts, cheeses, veggies and breads, or perhaps a tasty taco salad for roll-your-own burritos. Lunch is always accompanied by fruit, cookies, cold water and lemonade. After lunch, canyon walls constrict the flow of the river, creating an action-packed series of enjoyable Class III rapids. After we reach our take-out at the Salmon Falls Bridge, we will return to our campsite. You are welcome to take a swim or a hot shower, join a game of horseshoes, or sit back and relax with a beverage as your guides prepare dinner. The delicious dinner is served between 6:00 and 7:00 PM; it might be anything from barbecued steak to Dutch oven lasagna. Tasty deserts always follow. In the morning, we will enjoy a hot breakfast and drive to the North Fork put-in. Today’s action-packed paddling begins after less than a mile, where steep drops and boulder slaloms create a challenging series of Class IV rapids, with names ranging from Chamberlain Falls to Bogus Thunder. Our final rapid is a difficult Class IV named Staircase, which serves as the rite of passage for conquerors of the North Fork. For lunch, we pull ashore and have a delicious picnic. (Please note that lunch may be served prior to the launching of the trip, depending on our assigned launch time from CA State Parks.) At the end of the day, we reach our take-out point at Ponderosa Way and draw our adventure to a close. An OARS shuttle will be waiting to give us a ride back to the OARS American River Outpost. 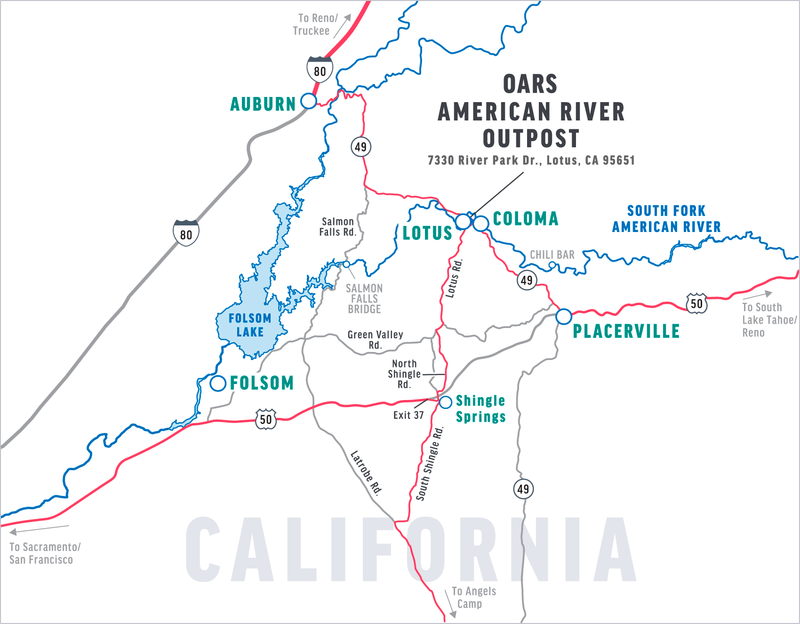 We will meet you near our camp store at 10:30 AM or 11:00 AM at the OARS American River Outpost, located at 7330 River Park Drive, behind Hotshot Imaging’s store in Lotus. Click here for a Google Map. From Placerville: Proceed north on winding Hwy 49 for about 9.5 miles (about 20—25 minutes) through the town of Coloma. Just past Coloma and the Marshall Gold Discovery State Historic Park, cross the bridge over the South Fork of the American. Immediately after crossing the river, you will see the “River Park” shopping center on the left, with signs for Hotshot Imaging. Please use the center’s second entrance, where a left-turn lane is provided at River Park Drive. Look to the back of the center, where you will see the entrance to our campground. You may want to check one week prior to your trip for an up-to-date weather forecast. We recommend you check the following web sites for weather in Coloma, CA: www.weather.com or http://www.accuweather.com. Please let us know if you have any medical issues that we will need to consider in planning your trip. There are several professional companies taking photos of each raft at some of the South Fork’s larger rapids, which provide great action shots. These companies are not affiliated with OARS and you will need to contact them separately to purchase these pictures. Hotshot Imaging is conveniently based in Lotus right next door to our campground; visit them after your South Fork of the American trip at their storefront on Hwy 49 to order pictures. (To order your photos online, you must request the photo link for your trip from Hotshot Imaging.) For more information, visit www.hotshotimaging.com or call (530) 621-0400. A $60/person deposit is required at the time of reservation. Final payment is due in our office 30 days prior to your trip. Please let us know if you would like us to automatically charge your credit card on file when payment is due. O.A.R.S. West, Inc. and cooperating agencies act only in the capacity of agent for the participants in all matters relating to transportation and/or all other related travel services, and assume no responsibility however caused for injury, loss or damage to person or property in connection with any service, including but not limited to that resulting directly or indirectly from acts of God, detention, annoyance, delays and expenses arising from quarantine, strikes, theft, pilferage, force majeure, failure of any means of conveyance to arrive or depart as scheduled, civil disturbances, government restrictions or regulations, and discrepancies or change in transit over which it has no control. Reasonable changes in itinerary may be made where deemed advisable for the comfort and well being of the participants, including cancellation due to water fluctuation, insufficient bookings (this trip requires a minimum of 8 guests), and other factors. There is risk in whitewater rafting, particularly during high-water conditions. Rafts and kayaks can capsize. You could be swept overboard. Your guide will make every attempt to assist, but you must be strong and agile enough to “self-help” and “float-it-out” without further endangering yourself or others. We reserve the right not to accept passengers weighing more than 260 pounds or with a waist/chest size exceeding 56 inches. We may decide, at any time, to exclude any person or group for any reason we feel is related to the safety of our trips. We are experienced at accommodating people with various disabilities. Please give us an opportunity to make you feel welcome. We need to discuss any special requirements ahead of time. On advancement of deposit the depositor agrees to be bound by the above recited terms and conditions. Prices subject to change without notice.